Guild seeks diverse acting pool. Audition Dates and times: Saturday, February 10 or Sunday, February 11, 4-6 p.m. No pre-registration required- just come when available. Audition Location: Northfield Arts Guild Downtown, 304 Division St.
Audition Requirements: Actors need not prepare anything in advance. No appointment necessary. You will be asked to read from the script, by yourself or with other actors. Some of the roles call for singing (solo and/or ensemble). If you like, you can prepare a very short song (1 minute or less), or the director will provide an easy song for you to sing. Scripts available for 24 hr perusal at The Guild office or available online here. 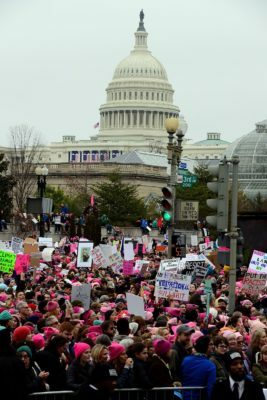 Women March on Washington is a new play in development (written and directed by Christine Kallman), and will be presented script-in-hand. The rehearsal and reading of the script are invaluable parts in the process of the script revision and development. Rehearsal information: Rehearsals are scheduled to begin Monday April 2. Character descriptions and able-to-play ages: Auditions are open to age 16 and older, female and gender non-conforming persons. We welcome all ages, colors and ethnicities, gender identity and expression, as well as people with disabilities, to audition. There is one role for a person of any age to play a character who is genderqueer (non-binary), and a role for a transgender woman. Marchers (includes many of the characters above) – Diverse characters who speak about why they are or are not marching, chant, and sing together traditional songs of the women’s movement. The Northfield Arts Guild is committed to building a creative and dynamic theater that celebrates individual differences and diversity and treats everyone with fairness and respect. The Guild encourages all - beginners or established artists - to audition for roles and to volunteer for technical positions.